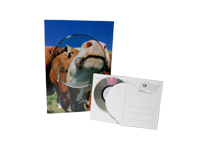 Learn about some of our CD and DVD shipping packages – the offers are innovative and fresh and will give an unusual touch to your mailing, that will not be forgotten to soon! 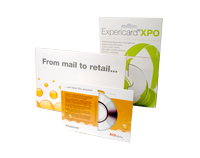 The Post-certificated Expericard is an ideal mailing solution, if you want to deliver 12cm discs. The Din A5 sized packages weighs in the smallest grammage only 19 g on the scales and therefore is very convenient for postage. An effect, that causes less burden on the environment! The package will be shrink wrapped, personalised and optimised for postage. At your wish we also do the postal deliveries for you. This Mailing cards are available in different DIN formats ( B6, A5, DIN lang etc.). Some with additional panorama flap. You will get products for 8 or 12cm media. A very effective product, extremely light and partially Post-certificated. As the most cardboard packages you will get these cards with spot colors, laqueries or embossings. The nice mailing solution in a new outfit. Because now the veneering is made by printed PE foil or paper on the front. The 8cm or 12cm media can be delivered easily as a postcard. An appearence that’s really eye-catching! This mailing package is available in different styles and formats. From a simple postcard up to a brochure with several numbers of pages. With its unique window-clip of Cocoleon, almost every printed matter can advance into a media-carrier. A very light weight mailing package for a 12cm disc and a cover letter. Optionally available with or without window. The cover will be closed with an adhesive stripe.